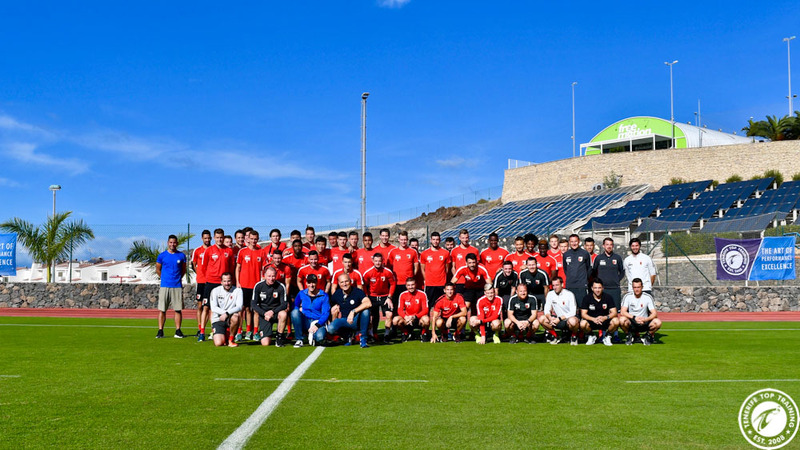 The Winter Football Training Camps season at the Tenerife Top Training started in 2018 with a well-known guest from Germany. For the first time, a Bundesliga club was visiting T3 for one week to prepare for their second half of the campaign. The FC Augsburg completed two training sessions per day, both on the lush green of one of our football fields and in one of the two gyms. Then they went to cool down in the 10 degree cold ice baths, while the players could tan at the same time in the most beautiful sunshine outside. Unfortunately, on the 7th of January we had to say goodbye to FC Augsburg after an effective and sunny football training camp, whereupon they successfully started the second half of the campaign against Hamburger SV (HSV) with a 1-0. On the same day when the Bundesliga club left us, we expected another novelty in Tenerife. For a week we welcomed for the first time a women’s team for their football training camp on our site. The women’s team of FC Basel 1893, headed by head coach Sissy Raith, created their training sessions from a healthy mix of ball training, balance and body control exercises, as well as athletic units in the gym. The Basel ladies play in the NLA, the national league A, which is the highest division in Swiss women’s football. In order to prepare for their second half of the season, the women regularly trained with two units a day, one in the morning and one in the afternoon. The ladies also enjoyed a cold ice bath during beautiful weather. was rounded off by a friendly game during the training camp against the ladies of the UD Granadilla Tenerife Sur from the 1st Spanish League of Women. On January 10, 2018, the ladies from Switzerland and Tenerife met each other on the lawn of the Tenerife Top Training. Both football teams delivered a competitive, passionate and high quality game. After the break, the coach of Granadilla substituted six times, which further increased the pressure of the Canarian hosts, as they often had the upper hand before. In the 55th minute it was Sara Tui who hit Granadilla’s goal after a deflected shot to give the hosts the lead. The Basel players once again made every effort to equalize, but after the final whistle they had to defeat with a final score of 1:0. However, it should be noted that the Spaniards were already in the championship mode, after they had won a victory against Espanyol Barcelona three days earlier and the Swiss were only in training for a week and had two injured players.. However, the lost friendly game did not spoil the girls the free afternoon the next day, which they used for a whale-watching boat trip. The ladies of the Swiss football club left the Tenerife Top Training and the island still highly motivated and with the sun in their luggage. We wish the girls of the FC Basel all the best and much success for the second half of the season and look forward to the other football teams from Basel very soon. The U15, U16, U17, U18 and U21 of the FC Basel 1893 will also complete their training camps in the coming weeks and we are already practicing on our Swiss German.